Opinion Mining Company, BrandsEye has published their annual South African Banking Sentiment Index. For its 2017 Index, BrandsEye partnered with Certified Customer Experience (CX) Professional and expert, Julia Ahlfeldt, developer of the Net Experience Effect, a barometer for the health of brand’s customer experiences.In order to rank the banks by sentiment and gauge public opinion, BrandsEye tracked 1 790 933 social media posts about the big five banks between September 2016 and August 2017. To achieve high levels of accuracy, BrandsEye distributed a significant sample of the total posts to a proprietary crowd of vetted and trained local language speakers. Each post was then coded and verified by crowd members, who assessed the sentiment of the post. “Our AI system learns from how our crowd processes data to better serve the crowd with relevant information. If you’re using only algorithms to understand how people feel you’re probably getting the wrong answers”, added Kloppers. The index also integrated BrandsEye’s topics data from July 2017 with Ahlfeldt’s Elements of CX model – which ranks a business’s performance based on its “Value Proposition”, “Ease of Use”, “Resolution” and” Promise Delivery” – to uncover the drivers of customer feedback and why South African consumers prefer one bank over the others. For the third consecutive year, Capitec had the highest net sentiment. Capitec’s low bank charges was one of its strongest advantages over competitors and the most positive topic discussed. Absa had the lowest net sentiment score. 32.2% of Absa’s negative sentiment related to the release of the Public Protectors report on the Bankorp bailout. Reviewing BrandsEye’s topics and sentiment data for July 2017 against Ahlfeldt’s Elements of CX shows banks performed the best against their “Value Proposition” (-11,7% sentiment), with this theme being the most talked about among consumers. Of these, Capitec scored +34,9% while Nedbank scored +1,2%. All banks performed poorly on “Ease of use” averaging a net sentiment of – 74,7%. The lowest individual score was Nedbank (-83,4%) and highest FNB (-55,6%). Resolution of issues was also a pain point with an average score of -56,6%. Nedbank customers highlighted this as a concern. 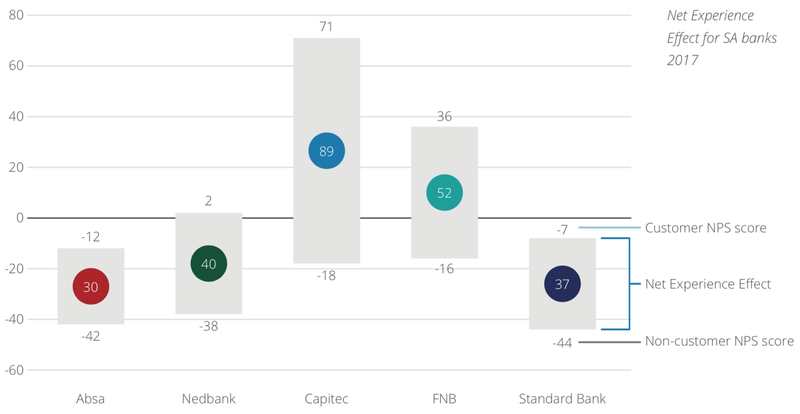 While they did not generate positive sentiment for this category, Capitec outperformed others in the industry, with a -29.1% net sentiment for topics within the CX element. “Promise = delivery” was the second most talked about CX Element, and faired only slightly higher than issues regarding resolution scoring -51,3%. “It’s clear that South African banks do have some work to do to keep their customers happy. Fees, look and feel of branches, reward programmes and technological innovations can drive loyalty, but only if brands live up to their promise to consumers. When they don’t it can undercut the customer relationship and erode loyalty,” says Julia Ahlfeldt.